Did you know that brands spent $5.67 billion on influencer marketing in 2018? And this amount is forecasted to reach $8 billion by 2020. With the rising popularity of influencer marketing and brands spending tons on money on it, it has become a lucrative way for people to earn money. And come influencers do charge large amounts of money if they have a substantial follower base and an engaged audience. Instagram influencers can charge anywhere between $75 and $3,000 per post. Even if you are at the lower end of the spectrum, it is still a lot of money for just one Instagram post. This is probably the reason why so many people have chosen this path, to earn quick money and become famous. But, if this is something you are really interested in, we have got you covered. 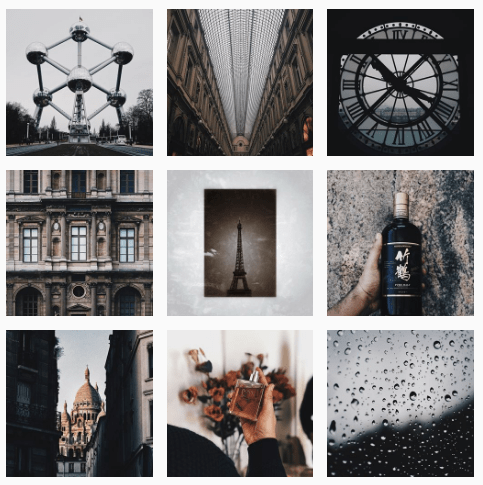 In this post, I have provided a detailed list of things that you need to do to become an Instagram influencer and start earning money. Read on and learn how to become an Instagram influencer. To become an Instagram influencer, the first thing you need to do is find a niche that suits your personality. This needs to be something you’re passionate about. Something in which you have a good deal of knowledge and interest. Just because someone else is doing something and is successful, doesn’t mean you should too. To become an Instagram influencer in any field, you will have to post about it regularly and consistently. 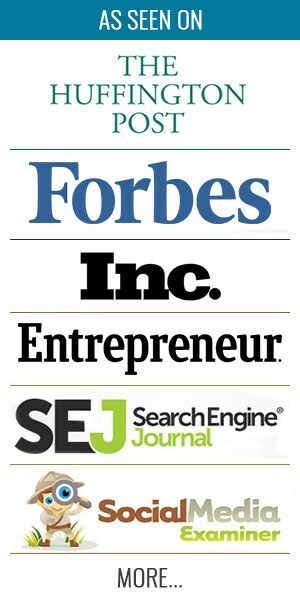 So, selecting the right niche is very important because you will have to spend a considerable amount of time researching it and posting content on that topic. So pick a niche that you’re genuinely passionate about. Maybe you’re great at DIY crafts? Or maybe you love food, and have a great deal of interest in different types of cuisines? Maybe you’re into fashion and are always aware of the latest styles and trends? Your Instagram posts should reflect whatever truly interests you and not some random stuff. Your niche might even be a combination of different things, as long as they’re not random. 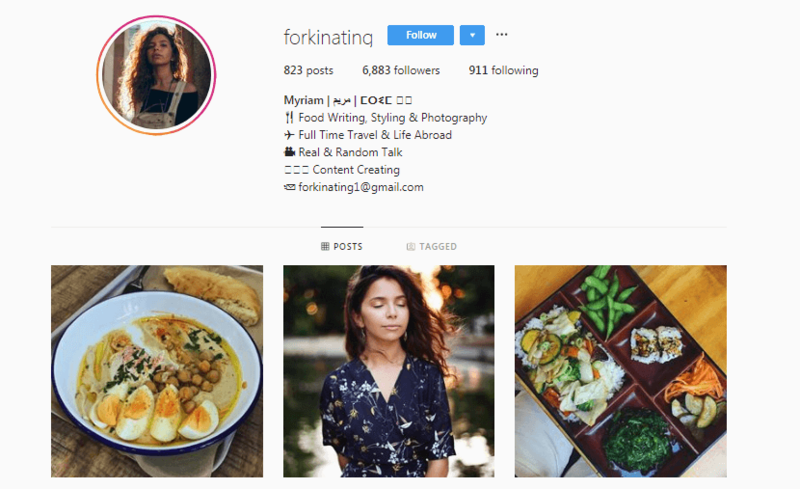 Here’s an example of an Instagram influencer whose niche is food, travel, and lifestyle. As you can see, her Instagram feed has a good balance of posts relating to all of these. Once you have decided on your niche, you need to create an attractive Instagram profile. The very first thing that you need to focus on is creating an Instagram bio that immediately catches people’s attention. It should talk about your story in a way that engages people. Remember, it’s one of the first things that a brand or a potential follower will see on your account. So if you want to know how to become an Instagram influencer, you need to first learn how to create an attention-grabbing Instagram bio. Influencer and travel blogger Helene Sula has a compelling and attractive Instagram bio. In the name field, she has cleverly included “travel blogger,” so that her profile shows up for such searches. And in her bio, she tells her story of how she moved to Germany to explore Europe leaving everything behind. Except for her pups and her husband. Now, isn’t that noteworthy? If you think you can become an Instagram influencer just by sharing photos, you clearly have it all wrong. The captions that go along with those photos are just as important as the photos themselves. Use them to tell your stories and connect with your followers on an emotional level. Give them a reason to trust you, follow you, and engage with you. However, in your quest towards engaging them don’t forget to be genuine. Because that will be easily seen through. Instead, share your personal stories in a way that your audience finds them interesting yet authentic. 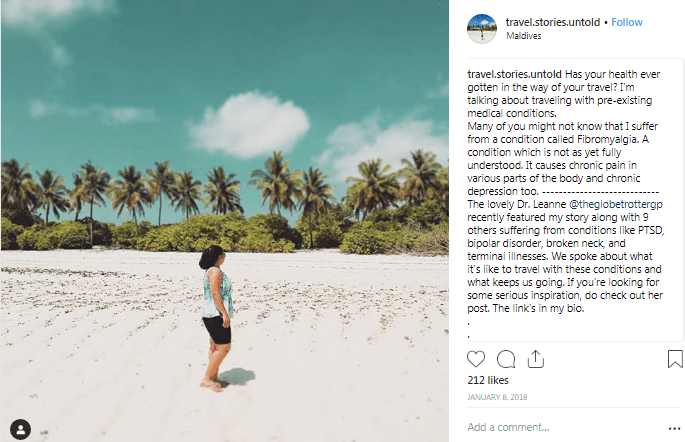 Check out this inspiring story from a travel blogger, for example. She talks about how she continues traveling with a pre-existing medical condition. You can see that the post has a pretty high engagement rate which means it was well-received by her followers. And brands attach much greater importance to the engagement rate than the number of followers when they collaborate with influencers. This is one of the pre-requisites if you want to learn how to become an Instagram influencer. Not only should each of your photos be visually-appealing, but your entire feed should look appealing when viewed as a whole. This means that all of your photos in the feed should look good, individually and collectively. Many Instagram influencers follow a particular style of editing their photos so that the color or composition is uniform. You can use tools like VSCO or Lightroom to edit your photos or you can just use the built-in filters on Instagram. Also, make sure that your photos are taken in high-resolution and plenty of light to make them look really good. Check out the account of this lifestyle Instagram influencer and see how beautifully he keeps the tones uniform. This gives his Instafeed an incredible visual appeal and makes it look aesthetic too. Posting content consistently is another crucial prerequisite if you want to learn how to become an Instagram influencer. Most Instagram influencers post daily or once every two days. However, some of them post a few times a day or even a few times a week. Studies have revealed that an increase in your content-posting frequency can boost engagement rates. However, when you decide what your posting schedule needs to be, make sure that you choose wisely. Because it needs to be something realistic that you can actually stick to. Setting an unrealistic goal to which you cannot adhere will not help you in any way. If you find sticking to a schedule difficult, you can schedule your posts with tools like Buffer, Planoly, Preview, or Ripl. These platforms allow you to create your content in advance and set the dates and times for posting. So you don’t need to do it yourself, but your content gets posted automatically. Preview is free for use and so is Planoly for 30 photos per month on a single Instagram account. Buffer allows you to schedule up to 10 posts for free across any 3 of your social accounts. Ripl offers subscriptions starting at $14.99 per month, but also has a free basic plan with limited features. The best tip anyone can give you on how to become an Instagram influencer is to use hashtags. Hashtags are important because they let your content to be found by other Instagram users. Instagram allows you to use a maximum of 30 hashtags on a photo, and I recommend using them all. But what kind of hashtags should you choose? Remember that hashtags having high search volumes aren’t necessarily good for you. Because high search volumes imply high competition too. So the chances of your post being discovered using those hashtags are bleak. Instead, choose hashtags that have decent search volumes and maximizes your chances of appearing in the top posts. Ideally, use a combination of hashtags varying in search volumes from above 10,000 to 1 million. But definitely, not more than a million. 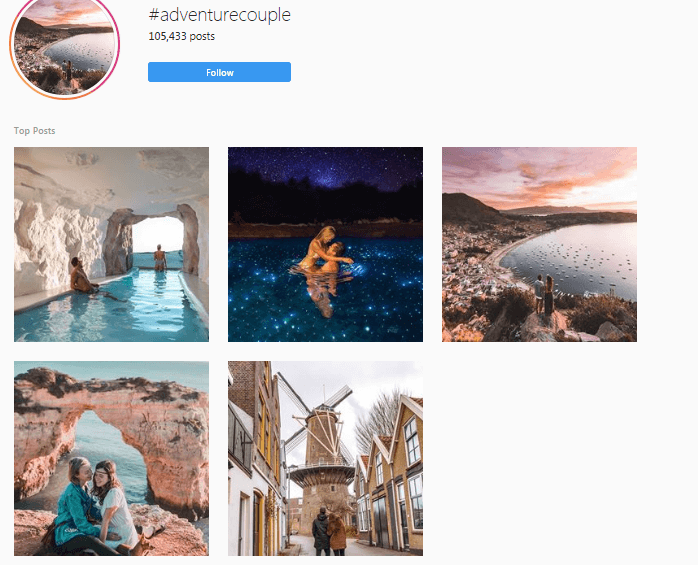 For example, this post by an influencer uses the hashtag #adventurecouple. This is the top post for this hashtag having search volumes of more than 105,000. If you’re serious about learning how to become an Instagram influencer, you need to get a business account for your Instagram. There are numerous benefits of switching to a business account. 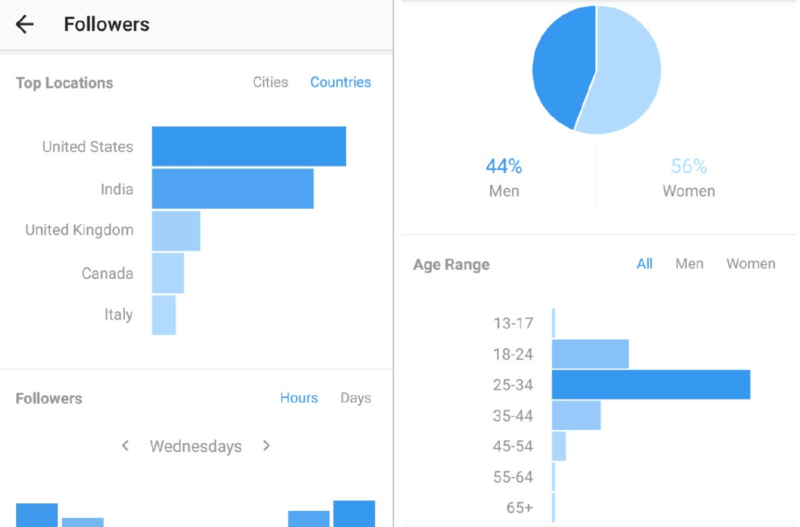 The most important benefit is that with a business account, you get access to Instagram Analytics. You’ll be able to see not only your follower demographics but also which posts are getting better engagement. You will also be able to see the days and times which give you the best engagement. If you want to become an Instagram influencer, it is important to understand your audience and learn what content works best for them. Follower demographics are very useful when it comes to pitching to brands for collaboration. Because numbers speak louder than words. So, getting an Instagram business account is an important step if you want to become an Instagram influencer. Instagram Stories are probably the biggest thing right now on Instagram. More and more users and influencers are joining this bandwagon. In fact, more than 200 million Instagram users are using them every day. This makes them a perfect weapon to grow more followers and gain visibility. Even people who aren’t your followers can discover you from your Instagram Stories. 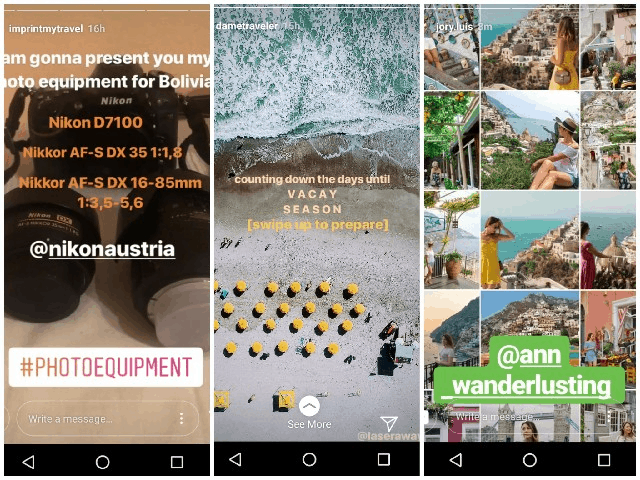 By adding hashtags or locations to Instagram Stories, you can be discovered by more people. And if you have 10,000+ followers, you can include an outbound link using a “swipe up” option on Stories. You can even tag others on your Stories and give a shout out to other accounts. 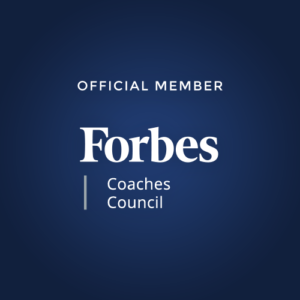 This is not only a great way of building relationships but also growing your own following. Because those accounts are likely to return the favor too. And this means you get more visibility. Because of these benefits, a lot of influencers use Instagram Stories. And if you are serious about becoming an Instagram influencer, you should start using Stories now. Social media is all about people and how you engage with them. Engagement is one of the most important factors that will help you become an Instagram influencer. When someone comments on your photos, make sure that you reply to them. Also, return the favor by liking and commenting on their posts. There are actually two stages of learning how to become an Instagram influencer. The first, of course, is to grow your followers organically and engage them. The second, and probably more important for some, is to make money as an influencer. So, once you have grown your followers above a thousand and have a decent engagement rate, start your brand outreach. The easiest way is to tag relevant brands on your photos to put yourself on their radar. Sometimes brands even feature such photos on their Instagram account giving you greater visibility. You can also send direct messages to brands you think are relevant to your niche. Especially, if you have seen them collaborate with other influencers in your field. Work on a pitch that talks about why you are reaching out and what you can offer them. I’m not saying it’s easy but you might be pleasantly surprised at the responses. You can even join platforms like Grin, InsightPool, HYPR, InfluencerBay, TRIBE, and TapInfluence to find and connect with relevant brands. Some of these platforms need you to have a certain number of followers to be able to participate in campaigns. So, use this channel when you have reached a certain follower count. This is a rookie mistake I’ve seen many Instagram influencers make to pave an easy road to success. Paid followers are no good to you. If you want to become an Instagram influencer and make money, organic is the way to go. Also, it is not that difficult for brands to identify influencers with paid followers. And if someone realizes that you have a high percentage of fake followers, you could lose your credibility in the industry. This could affect all of your future collaborations or lack thereof. Getting caught having paid followers can be detrimental to your success as an influencer. If you really are serious about your goal to become an Instagram influencer, you need to do it the right way. It’s true that you cannot become an Instagram influencer overnight. You will need to be patient and make sure that you follow the above steps, to become an Instagram influencer. It might take a few months, but trust me, you will definitely start seeing results. I’ve seen and helped quite a few individuals land brand partnerships within a few months of following these steps. And there’s no reason why you can’t do so as well. Can you think of any other tips on how to become an Instagram influencer? Let me know in the comments below. And if you’re looking for some personal guidance to become an Instagram influencer, get in touch with me now! Those are great tips. Do not buy followers – that will be more negative than positive on the algorithm. Instagram is a powerful social media channel to target new-age audience. It especially works like a magic for fun niches – entertainment, travel, food, fashion, etc.